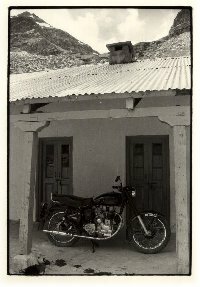 The Enfield factory at Tiruvottiyur in Madras is now forty years old and produces some 20,000 motorcycles annually, using many of the original machine tools and dies from the original British parent factory. Most parts, right down to the pinstripes on the paintwork, are still hand finished. Enfields are now exported to 26 countries, including the U.K. Fritz Egli of Egli Vincent fame has turned his hand to revamping the venerable Enfield, and the result is a very pretty motorcycle which performs a great deal better than the original, whilst retaining the classic understated charm of the Royal Oilfield.